The house in Independence is the centerpiece of the Harry S Truman National Historic Site. When Truman and his new wife moved in with her mother and younger brother in 1919, the house had been in the Wallace family since shortly after the Civil War. Bess Truman’s grandfather bought the land in 1867 and immediately began expanding the small existing house. By 1885, it was the most expensive residence in town, with 14 rooms, indoor plumbing, gas lighting, elaborate porches, bay windows, and interior details. Born in rural Missouri in 1884, Harry S Truman moved to Independence with his family when he was six years old, so that he and his brother and sister could attend city schools. He met his life-long sweetheart and future wife in December 1890. They attended school together from elementary through high school but lost touch after Harry graduated in 1901. Truman, an excellent student, could not afford college and spent most of the next five years working at clerical jobs in nearby Kansas City. In 1906, he moved to Grandview to help his father run the family farm. In 1910, while visiting his aunt, Harry encountered Bess again and a nine-year courtship ensued. Harry made the 20-mile trip from Grandview to Independence many weekends, often staying with his aunt, who lived across the street from Bess’s house. In 1917, Truman enlisted in the army, serving with distinction in France during World War I. When he returned to the United States, he married Bess and moved into the Delaware Street house, both to save money and to help care for Bess’s ailing mother. Truman and a friend established a men’s clothing store that same year. Although the business failed in 1922, Harry refused to declare bankruptcy and insisted on paying off all his debts in full. Truman found his real calling that same year, when an Army buddy convinced him to run for the Democratic nomination for the Jackson County Eastern District judgeship, an administrative position. In 1924, he lost when he sought reelection, in part because of opposition from the Ku Klux Klan. The birth of Margaret, his adored only child, helped soften the defeat. In 1926, he won election as presiding judge of Jackson County, roughly the equivalent of county commissioner. Over the next eight years, Truman earned a reputation for honesty and efficiency. His political career relied on the support of the sometimes-corrupt political machine of Kansas City boss Tom Pendergast. Truman was aware of the corruption and sometimes looked the other way but never profited from it personally. His personal integrity was so well known that his constituents continued to vote for him even after the Pendergast machine collapsed. In 1934, he ran for the United States Senate and won. The Trumans moved to Washington, DC, but Bess and Margaret spent much of the year in Independence, so that Bess could take care of her mother and Margaret could attend public school. Reelected to the Senate in 1940, Truman gained national recognition for his work as chairman of the “Truman Committee,” which investigated war profiteering, waste, and unfair practices in government contractors that produced military equipment and supplies during World War II. 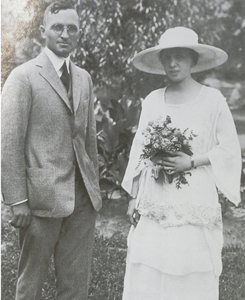 After Bess Truman’s mother joined them in Washington in 1942, the family returned to Independence only during the summers and other vacation periods. When Truman became president in 1945, national attention focused on the new first family and their home. For six weeks in the spring, roofers, carpenters, and painters worked feverishly to prepare for the Trumans’ first visit to their old home. Neighbors helped paint the house and the mayor of Independence had a flagpole built on the front lawn. He declared that the “Summer White House” should not be without the Stars and Stripes. Although Truman took his work with him, visits to Independence were a welcome break from life in the White House. The family spent most summers and Christmases at home in Missouri. Throughout his presidency, on Christmas Eve, Truman spoke to the nation over the radio and used a telegraph key to light the National Christmas Tree in Washington, DC. In the next few months, Harry Truman had to make some of the most difficult decisions any president has ever faced. He led the nation to victory in Europe on V-E Day, May 8, 1945. He participated in the partition and occupation of defeated Germany, and in the formation of the United Nations. His meeting with Churchill and Stalin at Potsdam, outside Berlin, played a major role in post-war Europe. Truman knew nothing about the American atomic bomb program when he took office, but he was the one who had to make the decision to use the bomb. He hoped the bomb would end the war in the Pacific and thereby avoid the enormous loss of life that would result from having to invade the Japanese home islands. World War II ended on August 14, 1945, within days of the destruction of the cities of Hiroshima and Nagasaki. Truman made many enemies during his first three years in office, and most people expected him to lose his bid for reelection in 1948. On October 31, he ended his famous thousand-mile “whistle-stop” campaign in Independence. In a radio broadcast delivered from his living room, President Truman summarized his campaign and proclaimed the Democratic Party the “party of the people.” Reporters surrounded the house that night waiting for the election returns. When final returns were in, Truman had defeated Republican Thomas E. Dewey by a slim margin and had led his party back into control of Congress. Truman’s presidency also saw the beginning of the Cold War. His “Truman Doctrine” sought to use a system of security alliances and direct military and economic aid to contain Soviet expansion. His Marshall Plan, an unprecedented aid program, helped the countries of Western Europe recover from the devastation of the war and countered the political influence of local communist parties. In 1948-49, he directed the massive airlift that broke a Soviet blockade of West Berlin, surrounded by Communist East Germany. In 1950, he enlisted the aid of the United Nations in repelling an invasion of South Korea by the communist North Korea. The following year, in a controversial move, he removed General Douglas MacArthur as commander in Korea. MacArthur had defied Truman’s policies, risking a possible conflict with communist China. This period also saw the rise of “McCarthyism,” a red scare much like the intense fear of communism that followed World War I. Truman denounced Senator Joseph R. McCarthy’s accusations of communist infiltration in the United States Government, but the charges ruined many careers and became a major issue in the 1952 presidential election. The domestic decisions Truman faced were no easier, as he had to preside over a hasty and badly planned reconversion of the economy of the United States from a war footing to a peacetime basis. In the fall of 1945, he initiated his “Fair Deal” program, which was to be the first step in this process. Congress ignored or rejected many of the "Fair Deal" programs, including those that would guarantee civil rights through a permanent Fair Employment Practices Committee and provide Federal grants for education and national health insurance. Congressional opposition grew even stronger after the mid-term elections of 1946, when Republicans took control of both the House and the Senate. Business leaders and labor unions rejected Truman’s efforts to prevent post-war inflation by keeping wartime wage and price controls, and 1946 brought an unprecedented wave of strikes in major industries. Truman intervened directly in the most important of these. On the other hand, he vetoed the Taft-Hartley Act, which he considered anti-labor. Congress immediately overrode his veto. In 1950, he narrowly escaped assassination by Puerto Rican nationalists. Truman decided not to run for reelection and retired to Independence in 1953. He enjoyed quiet walks and spending time with family and friends. He remained active in the Democratic Party, wrote his memoirs, and worked tirelessly to create the Truman Presidential Library. He died in 1972 at age 88. He and his beloved Bess, who died in 1982, lie next to each other in a courtyard of the library. The Harry S Truman National Historic Site consists of two parts: the house and one-acre lot in Independence and the 10 acre Truman Farm in nearby Grandview. A self-guided walking tour of historic Independence provides visitors a glimpse of Truman’s small town life and includes sites such as Clinton’s Drugstore, where Harry held his first job and the Jackson County Courthouse, where he began his political career. Other family homes are also open to the public. The Truman Presidential Library, administered by the National Archives and Records Administration, is located just north of the Delaware Street house. The Truman Home located at 219 N. Delaware St. in Independence, MO is the heart of the Harry S Truman National Historic Site, a unit of the National Park System. Click here for the National Register of Historic Places file: text and photos. 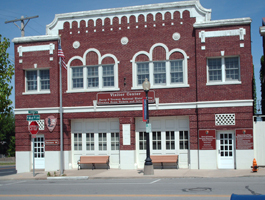 The Visitor Center is located five blocks away, in Historic Fire Station No. 1 at 223 N. Main St. at the corner of Truman Rd. and Main St. The Visitor Center is open seven days a week from 8:30am to 5:00pm. Guided tours of the Truman Home in Independence are available between 9:00am and 4:30pm, seven days a week between Memorial Day and October 31; there are no house tours on Mondays from November 1 until Memorial Day. Tour tickets may be purchased at the Visitor Center for $5.00; children 15 and under are free. The Truman Farm Home located at 12301 Blue Ridge Blvd. amid the retail and commercial district in Grandview, MO. is not open to the public. The farm house grounds are open daily, year-round dawn to dusk. Audio tour available onsite. For more information, including family history and audio files, visit the National Park Service Harry S Truman National Historic Site website or call 816-254-9929. 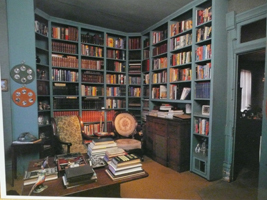 The Harry S Truman Presidential Museum & Library is about 1.5 miles from the Harry S Truman NHS, at 500 W. U.S. Hwy. 24, Independence, MO. 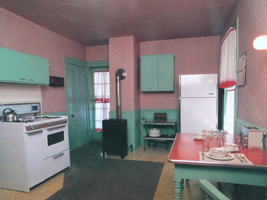 The Truman Home is the subject of an online lesson plan, Harry Truman and Independence, Missouri: “This is Where I Belong”. The lesson plan has been produced by the National Park Service’s Teaching with Historic Places program, which offers a series of online classroom-ready lesson plans on registered historic places. To learn more, visit the Teaching with Historic Places home page. Both the Harry S Truman House and the Carriage House have been documented by the National Park Service’s Historic American Buildings Survey. Visit the National Park Service Virtual Museum Exhibit on Harry S Truman: American Visionary.